You finally have some time to yourself. The kids are in school, your spouse is off to work and you can finally relax on your day off. Just as you get settled in, you notice a dripping noise coming from the bathroom. You get up and walk into your bathroom only to find that your sink faucet is slowly letting out droplets of water, drip by drip. While these little droplets might not seem like a big deal, they could be costing you some serious money. 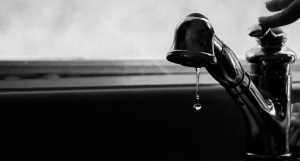 In the case of a leaky faucet, each drop of water accumulates until you’re wasting nearly 20 gallons of water per day! This is just an example of one of the common ways that people waste water (and their hard-earned money) on a simple issue that could easily be remedied by a professional plumber. Our goal at Troy Trawick Plumbing is to ensure that your home is a well-equipped fortress of water-conservation, which is why we want to provide homeowners with some tips on how to minimize water waste and save money! Always turn off the water when brushing your teeth. This simple turn-of-the-knob can save up to four gallons a minute. For a family of four, that’s roughly 200 gallons per week! Always check your showerhead and sink faucets for leaks. One drip per second adds up to five gallons a day. If left untreated, a single leak could waste up to just over 150 gallons of water per month! Take showers instead of baths. We know you love nothing more than to relax in the tub after a long day, but the average bathtub requires between 35 and 50 gallons of water to fill up. A simple trick to save water when washing dishes by hand is fill one basin with wash water and the other with rinse water. Don’t just let the water run the entire time you’re washing dishes. Try to only use one glass to drink from throughout the day in order to cut down on the amount of dishes you have to wash. Remember to take your dinner out of the freezer either in the morning or the night before and let it defrost in the refrigerator in order to avoid having to use running water. Learn how to use the water meter at your home in order to check for leaks or any other water-wasting issues. Always go over your monthly water bill in order to spot any unusually high usage throughout the month. Although you might be conscious about leaks inside your home, make sure to periodically check any outdoor pipes, faucets or sprinklers for leaks! Remember, water conservation efforts will not only save you money, every drop you save also helps your community and the environment. Hopefully these tips and tricks will make water conservation a no-brainer in your household and for any plumbing repairs or remodeling, our team here at Troy Trawick Plumbing is always here for you! This shows real exrtpeise. Thanks for the answer. Hi Makailah! We’re thrilled that you enjoyed this read. Call us if you have any questions!